This afternoon we released version 4.0.0 of Samba. This is a significant milestone, and I'm very proud of the result. Samba 4 is the first version that can be a domain controller in an Active Directory domain. We embarked on this journey almost a decade ago - the first commit is from August 2003. It's been a long and bumpy ride. 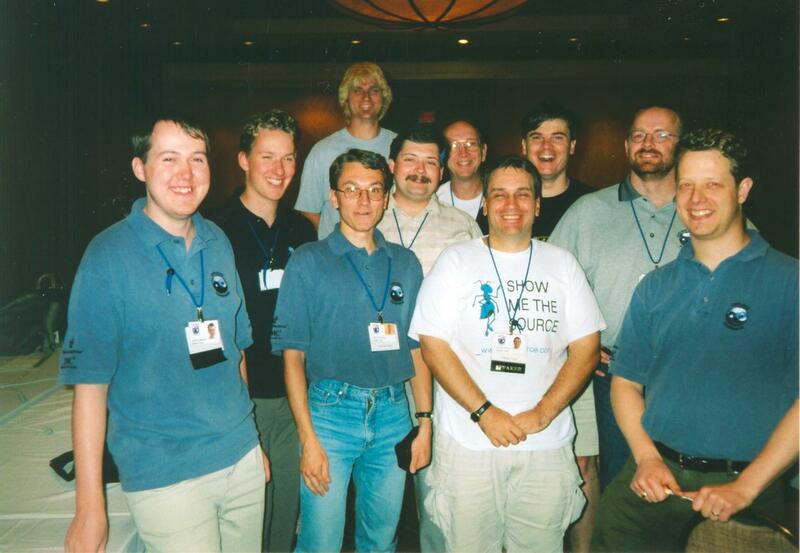 I hardly recognize the people in this team photo from 2003 (I'm second from the left). A lot has happened in that time. We wrote a few million lines of code. We migrated from CVS to Subversion to Git. We've drifted apart and grown back together as a team. In my youthful naivity I predicted a release "within 1 or 2 years" during a talk at the NLUUG in 2004. But Active Directory was a lot harder than we thought, and there were quite a few other distractions as well. I'm glad this release, which is by far the biggest and longest running software project I have ever worked on, has finally happened. Some older RCs of Samba 4 have already been packaged for Debian and Ubuntu, in the samba4 source package. For Debian jessie, these will be integrated into the main samba source package. Please use experimental if you do want to try the existing packages, as it is most up to date.